Just stumbled across an extraordinary blog, Undying Faces, which is dedicated 'to the history and preservation of life and death masks'. Death masks do have a certain uncanny appeal - check out the one of David Garrick: it looks so much like many of his portraits (complete with the big Huguenot nose!) and the one of Swift gives me the shivers. For a complete run-down of masks from the 1700s, click here. 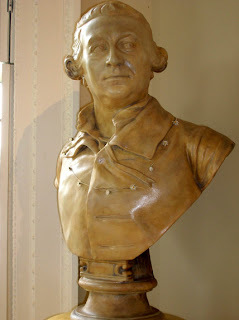 Above: bust of David Garrick from Garrick's Temple to Shakespeare. Haven't been here in a few days, and it looks like I've missed a lot! Regarding the death mask site, I haven't visited it yet, but I think it's safe to say ahead of time, "Ewwwww!" Surely the value of death masks was as the only way to obtain a true likeness? We still dispute whether Roubiliac, or Hogarth, or Heyman, captured the true likeness of Garrick - but there can be no question at all that the death mask is the real thing; the only likeness that is absolutely beyond dispute. In an age before photography, that must have given them a unique value, even if the notion seems a bit creepy today. They look like they're sleeping deeply. It's knowing that they were dead that makes it a bit voyeuristic. Thank you Halldor! Garrick was, of course, very difficult to capture because his face was so expressive (Hogarth had such trouble with the Richard III portrait that he ended up cutting the head out of the canvas and pasting it over with a fresh piece). So yes, this is the ultimate portrait.